NY Bagel Café is under investigation by at least three state Attorney Generals for allegedly violating anti-fraud, registration, and franchise disclosure laws. UnhappyFranchisee.Com estimates that more than 90% of the NY Bagel Café franchise locations that opened have failed, some of them multiple times. Why is commercial real estate company H&R Retail and broker Brian Mitchell putting their own reputations on the line for this troubled and troubling company? (UnhappyFranchisee.Com) H&R Retail, a real estate brokerage firm focused on retail tenants, landlords and developers within the greater Washington DC/Baltimore area, has a sort of shrine to NY Bagel Café on its website. NY Bagel Café & Deli is committed to providing quality food and cultivating satisfied customers. The long range vision is to become a highly visible company known as the best retailer of high quality bagels and deli products. NY Bagel Café & Deli was founded in 1994. Presently, there are 30 shops and 50 more under development. Yet H&R Retail is not being truthful. There are presently 9 NY Bagel Café locations open – not 30. There are perhaps a handful of NY Bagel locations under development – not 50. We have uncovered about 30 NY Bagel Café franchises that opened – and closed… some with multiple owners losing their investments in the same space. And the beautiful, upscale NY Bagel Café in the photo? That’s the failed NY Bagel Café location in Wesley Chapel, North Carolina where Rob & Jen Pistani lost their investment. It’s now the Greco Fresh Grille. It’s not clear how many (if any) of the 30* unsuccessful NY Bagel Café retail locations were sourced by H&R Real Estate or Brian Mitchell. It seems that most of them may have been the work of Brian Mitchell’s predecessor, NYB “Master Broker” Jack Intrator, former VP of Aptcor Commercial Real Estate. However, it’s hard to believe that Mr. Mitchell and H&R Retail are not aware that 9 out of 10 NY Bagel Café franchisees thus far have closed and were unable to meet the obligations of their leases. 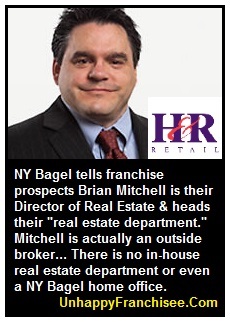 It’s hard to believe that Brian Mitchell and H&R Retail are not aware that the franchisees we assume they are encouraging to sign long-term retail leases (in the same types of locations as those that failed) are unaware of this horrendous track record and that franchisees are making huge financial commitments based on the ruse that NY Bagel Café is a proven, successful, concept. It’s hard to believe that a seemingly reputable company like H&R Retail, one that values its reputation in the regional real estate market, would help provide the undeserved credibility that NY Bagel Café and salesman Dennis Mason need to sign up the next trusting and vulnerable 30 franchisees. *NY Bagel President will admit to 15 franchise closures, and he has acknowledged that the disclosure documents he gives prospective franchisees state zero failures. NY Bagel Café appears to have no home office and no support staff to speak of. From correspondence with prospective and signed franchisees we’ve seen, NY Bagel Café franchise salesman Dennis Mason seemingly tries to give the impression that they do by referring to his internal “departments,” and “teams.” He tells franchise prospects that his “Director of Real Estate” Brian Mitchell heads up the NY Bagel “Real Estate Department,” and as soon as they send him the check Brian will deploy his team to scout locations in their market. He even references having to buy airline tickets for Brian’s real estate team to go to remote franchisee markets to work with them on locations. But according to the H&R Retail website, Brian is a full-time H&R Associate who joined the company in 2007. And it seems that they work with brokers in a national network to source local retail spaces, rather than fly Brian’s “team” to remote and unfamiliar markets. It seems unlikely (though possible) that Brian Mitchell is unaware of these representations, since the references to his position as NYB management is peppered throughout on many emails that Brian Mitchell is copied on. Brian Mitchell has not responded to multiple requests for clarification on his and H&R Retail’s relationship with NY Bagel Café. Is H&R Retail sourcing locations for illegally sold franchises in Virginia? The Federal Trade Commission requires all franchise sellers to present prospective franchisees with a document called a Franchise Disclosure Document (FDD) that truthfully discloses 23 Items of information, including the number of franchise failures in recent years. NY Bagel President Joe Smith has admitted that his FDD does not disclose NY Bagel’s franchise failures, as is legally required. Additionally, a number of states (called registration states) require franchisors to submit their Franchise Disclosure Document for review, approval and registration in order for them to legally sell franchises in those states. We confirmed that the NY Bagel Café franchise is not registered in Virginia (another registration state) and that NY Bagel Café cannot legally sell or open franchises there. Yet Brian Mitchell has been actively sourcing and procuring locations, presumably for NY Bagel franchisees. NY Bagel Cafe leased 1,850 square feet at 431 Maple Ave. West, Vienna, Va. from MAVV, LLC. Brian Mitchell with H&R represented the tenant. New York Bagel Cafe leased 1,500 square feet at Hilltop Shopping Center, Alexandria, Va. from WRI Hilltop Village, LLC. Brian Mitchell with H&R represented the tenant. We have asked Brian Mitchell whether these are franchise locations or company-owned. He has not responded. He have passed this information and Brian Mitchell’s contact information to the Franchise Division of the Virginia Attorney General’s office for their investigation. As more and more information and allegations are disclosed about the franchise sales tactics and business practices of NY Bagel Café franchisor, numerous vendors have been distancing themselves from the increasingly controversial franchisor. Lenders Loan Capital actually terminated a broker named Howard Fichman because of his continued relationship with NY Bagel Café and Dennis Mason. A number of franchise advertising portals have dropped NY Bagel Café as a client. What have these companies come to understand about doing business with NY Bagel Café that Brian Mitchell and H&R Retail haven’t? ARE YOU FAMILIAR WITH H&R RETAIL, BRIAN MITCHELL, OR THE NY BAGEL CAFÉ FRANCHISE?